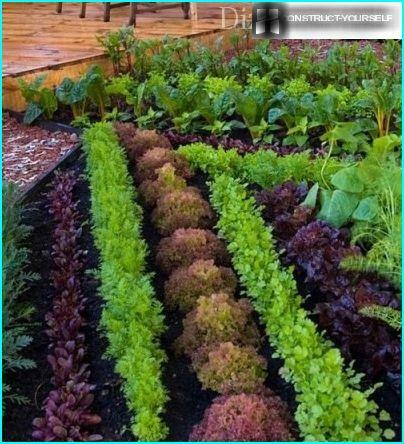 When gardeners divide the beds, they are increasinglymoving away from the traditional rectangular form to give an interesting view kitchen garden. And if in the area lack of space, so it would be desirable and lawn for relaxing break, and create a pleasant landscape, and still keep a place for the cultivation of "vitamins." In this case, instead of flower beds break beautiful beds that are pleasing to the eye not worse blooming roses and petunias. What are some salads that have a wealth of color and shape of leaves you can create an amazing song! 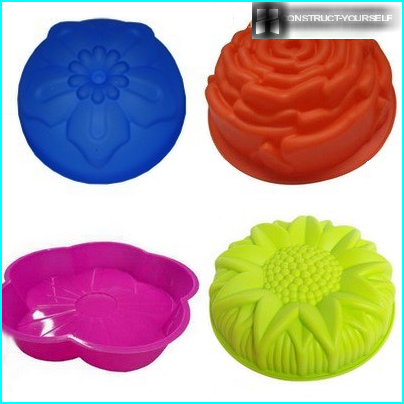 We have compiled a selection of interesting ideas for non-traditional beds. Perhaps someone from the creative design Truckers such methods will also appreciate the landscape. The easiest way to give the aesthetics of the kitchen garden -land plants do not monogryadkami and mixed plantings. Agronomists have long found that there is a culture, are planted in close proximity, you can improve productivity and get rid of the pests. But if their combined height and color, the shine in the garden beautiful beds. If it turns out in the garden area and the centervisible from all sides, it is most advantageous to a round bed, which will be the center of the villa of the composition. And it is necessary that on all sides it looked spectacular. Please carry out ground markings, by driving from the center ofpeg tied with twine. The second peg (pointed) fixed to the other end of the thread at a distance equal to the radius of your future bed. And pulled tight twine, outline the circle on the ground, which will limit your klumbogryadki. Then narrow the range of 10 cm, rascherchivaya place last row planting. And since moving to the center of the flower beds, leaving between the rows of the distance required for the normal growth of a particular culture. To make it easier to care for plants, divide the circle into sectors and lay the center of the narrow lanes. Then determined what crops will be on thisa bed planted. 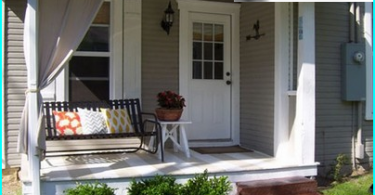 At the same time take into account not only a favorable neighborhood, but similar growing conditions. 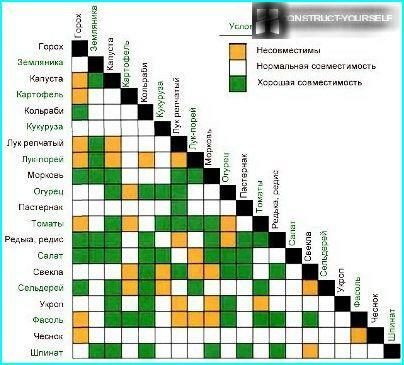 You should not be planted twine vegetables (cucumber, zucchini), because they grow apart and destroy the slender ranks. Best in this flower bed will look green, different kinds of cabbage, carrots, beets. In the center of tall plants are planted, for example,are building support for the beans. Another nearby - beets. After it - cabbage, lettuce, and then complete the fun strawberry bushes. All the plants are chosen with a gradual decrease in height, so on either side of bed will look spectacular, multi-tiered. 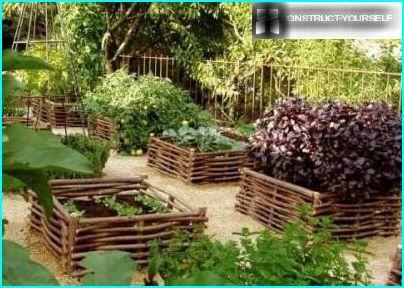 Article topic: Decorative garden: how to add originality to their vegetable beds? 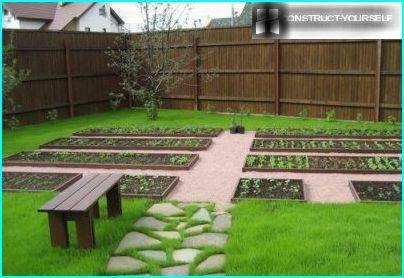 If the garden is located along the fence, thenbeautiful beds for vegetables can be created by making their triangles. At the same time preserve the layering, placing closer to the fence high culture and gradually reducing height. An interesting solution may be a narrow landingrabatok rows like walking along the tracks. For this purpose, suitable fluffy culture curly parsley, lettuce, spinach. They were planted in a single row of each variety, and in the foreground add -primuly undersized flowers, pansies, daisies and so forth. Unusually looks cabbage, alternating with the hosts. Some owners have created a beautiful farm tocottage, lifting them above the main surface of the earth and protecting decorative bumpers. In this case, "are killed at once two hares": beds better warmed, not blurred by sudden downpours and create original landscape. High beds do not require deep digging. It is enough to move the earth ordinary garden fork. 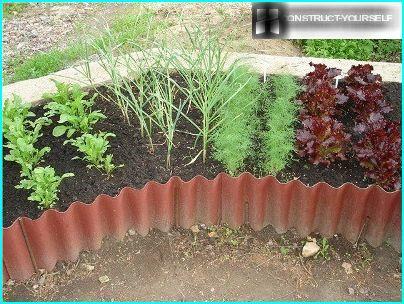 But first it is necessary to plan the shape and location of all vegetable "flower beds", and to protect them, dug decorative ledges. 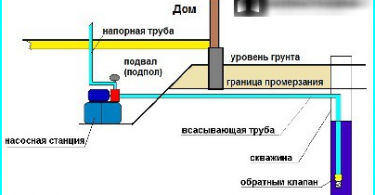 In the bed of the rim ennobled laidwaste paper, rags, kitchen waste, cleaning, etc. On top is covered with a layer of leaves and chopped herbs and the last layer of the ground asleep. This cake will slowly decompose, releasing large amounts of heat, and even in the coldest days of the root system of plants will feel comfortable. When the beds are created, it is necessary to refine andtrack, or landscape will not look complete. The easiest way to roll them and sow the lawn grass. But if you want better effect, you have to buy geotextiles, pave them the land, and pour on top of the decorative gravel, bark or colored sawdust. In urban areas are so smallareas that for a full garden is simply not enough land. In this case, resourceful hosts construct their own hands beautiful vertical ridges. Not every vegetable can grow in these conditions. 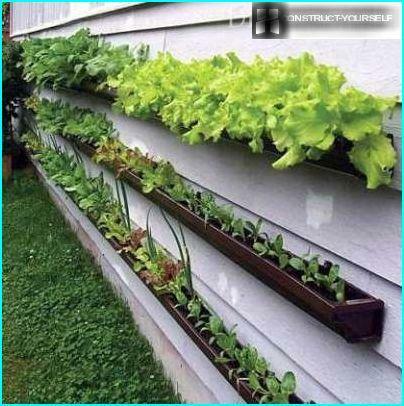 Vertical gardening well to strawberries, lettuces, onions, spices (basil, lemon balm, etc. ), Cucumbers and squash (in the conditions of constant watering). There are many ways how to make a beautiful vertical ridges. First, rubber paint, then covered with soil the lower tier, it set the second, etc. Seeds sown only in areas with loose soil. This mode is perfectly withstands greens and radishes. 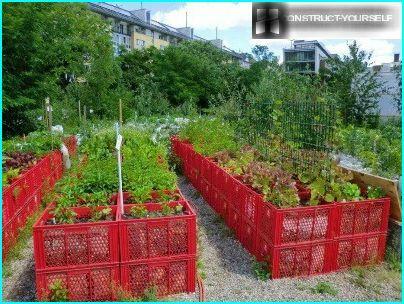 If the site is fenced by a wooden fence or farm building has an ugly, they are easy to transform into a green wall, nailed in rows of plastic boxes and landed them vegetables. 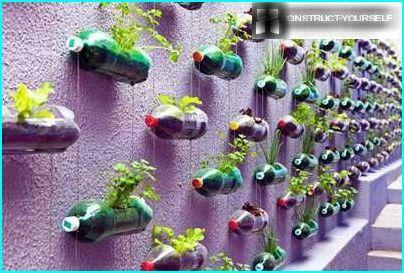 The second option - to tie plastic bottles, cutting a small hole on top and filling half the capacity of a light soil. Cucumber and other vegetables can create braidingdecorative arch. 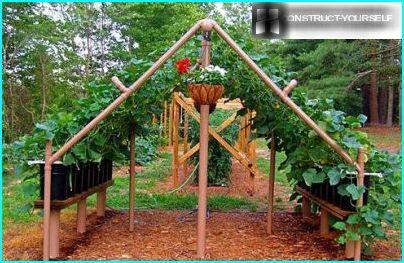 To this end, each cucumber planted in a plastic container, cook thin tubes pergola or arch, and put all the pots on the bottom bracket design. As growth check cucumber, whip them and tie should be sent until they are firmly not catch a mustache for the frame. 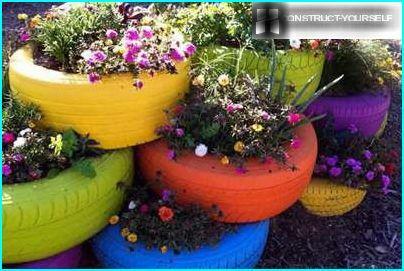 Creative gardeners come up with a lot of interesting ways to decorate a boring bed. If you are one of them - by all means try out the above methods, adding to them something of their own.